Education doesn't have to be fun. It should be engaging. Yes. But fun? I'm not so sure. A "fun" home education is one in which a mother has to wildly wave her "jazz hands" to create a small circus act. A "fun" education puts the pressure all on her to produce just the right environment. A "fun" education breeds a lazy learner who never explores, creates, or dives-deep because he never has to...information is handed to him on a glittering neon platter. An education...a TRUE education...is one in which a child personally invests, one that he is passionate about, one which inspires NOT requires him to learn. A child who is fully engaged doesn't need "jazz hands" or constant fun. He OWNS his own learning. It's about HIM and his effort. It's not about YOU and yours. Boredom is embraced in a true education because it produces an empty schedule and a desire TO DO. It encourages simplicity, not complexity. It fosters less, not more. That's why, contrary to what the world believes, the opposite of boredom is not busyness. It's purpose. That being said, I know how it feels to end the homeschool day worrying that every moment was a boring one...to feel like everyone was just checking boxes and puttin' in time. Sometimes on those days, I like to sneak in one simple EXTRA to breathe life into the learning. Nothing fancy. Just an uncomplicated SOMETHING that can propel bored kids towards purpose. Here's a list of 10 simple things you can strew and do in 10 minutes or less. While flipping through an art book together, your children will not only learn to recognize the masters and their works, they will also learn to think critically, observe, analyze, and grow a vision for society. 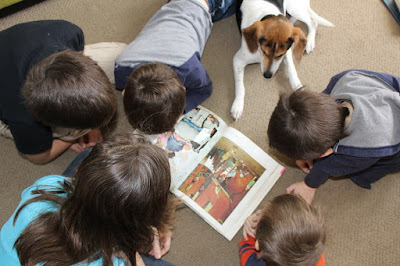 The last time my kids and I hunkered down with the The Norman Rockwell Treasury, we discussed the ever-evolving social and political climate of America in the 20th century. We looked at paintings of presidents, science discoveries, and world events. We talked about the absence of people of color in Rockwell's illustrations and some of the possible implications of that. We looked at Ruby Bridges' first day of school as tomatoes were being hurled at her and at the elation of a neighborhood as a WWII soldier came home. We looked at changes in fashion and invention; social status and religious practices. We discussed how TODAY and YESTERDAY are different, but so very much the same. We expanded our current view of the world and began to develop a compassion and an empathy for "the least of these." Parts of speech don't always have to be learned with a worksheet. A short Mad Lib can provide gentle grammar practice without the drill-and-kill approach. Ten minutes is all it takes to learn the scientific method. 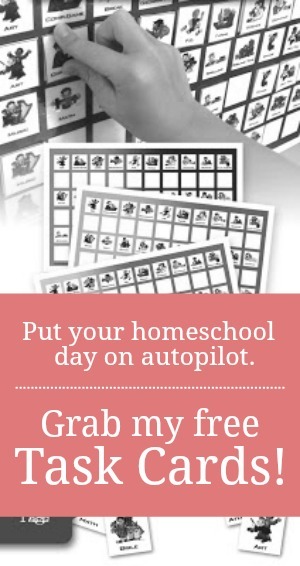 Using resources like Super Science Concoctions or Kitchen Science Lab for Kids along with a handful of items from around your kitchen, you can add a quick hands-on project to any homeschool day. My kids love Mind Benders. These critical thinking puzzles are challenging, but also engaging. They're like mental aerobics. They provide a quick jolt of mental energy during moments of learning lethargy. We're YouTube schoolers...always have been...probably always will be. With the help of a free filter, we can watch any video without fear of inappropriate ads or distasteful sidebar clips. By allowing my older children to watch short news reports on YouTube or from CNN for Students, I'm gently introducing them to current world events. CNN news, like many news programs, has a tendency to editorialize their broadcasts. But, even misrepresented news can provide great talking points for a Christian homeschool mother and her kids. I can engage my older ones in meaningful dialogue about the news and help them filter it all through a Biblical world view. 5-minute mysteries like the ones found in Stories to Solve or The Great Book of Whodunit Puzzles are quick, thought provoking, and subtly educational. They encourage problem-solving and sleuthing skills through simple short stories. Reading a short journaling prompt or story starter out loud can be just the thing to get the creative writing juices flowing. 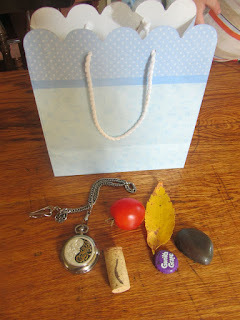 Or better yet, toss five seemingly random items into a sack and create a prompt bag. Encourage each of your kids to take one or two things out of the bag and incorporate those items into a short story. 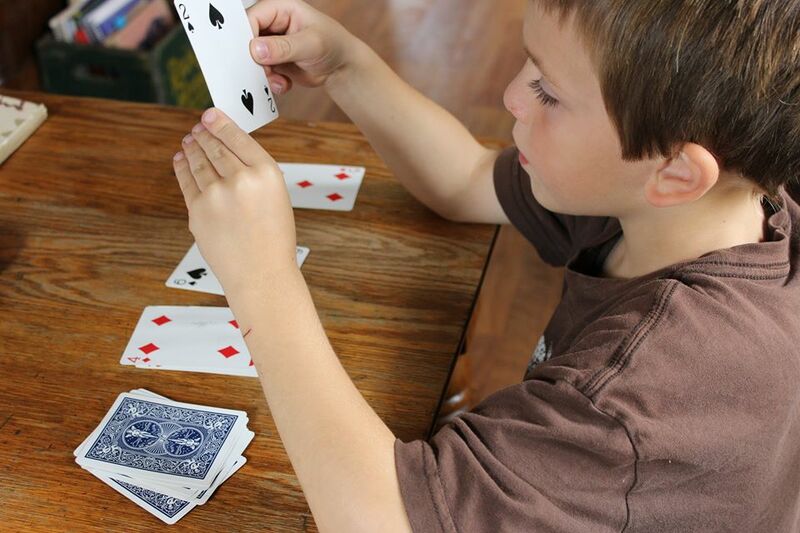 When helping your children memorize math facts, skip the flashcards and drills and use a deck of playing cards instead. Play a five-minute game together and gradually introduce all the fact families. No nagging required. Here's a handful of games to get your started>>> . Even if you don't have time for a full nature walk, you can still add nature study into the day. Step outside your front door, grab the first small piece of nature you see...a bug, a leaf, a seed pod, etc...and place that item on the dining room table. 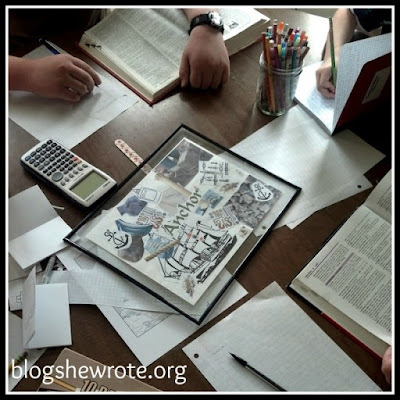 Invite your kids to gather around and sketch (rub, diagram, glue) it into a nature notebook. You don't have to take the time to look it up in a field guide and discuss it at length if you don't want to. Just enjoy the simple process of observing and sketching together. Encourage your kids to do some word-smithing by creating this simple word collage featured at Blog, She Wrote. The full project will, obviously, take more than ten minutes to complete if each child makes his own collage. But, you can simplify the process by creating a group collage. Using the dictionary and a thesaurus, make a short list of the denotative and connotative meanings of one word. Give everyone a discarded magazine or access to the internet for 5 minutes or so. Urge them to find and cut out (and/or print) one picture that embodies the word that you've chosen. Mount all the pictures together to create a beautiful piece of literary art. Education doesn't have to be fun. But, it should be engaging. It should inspire and spark curiosity. 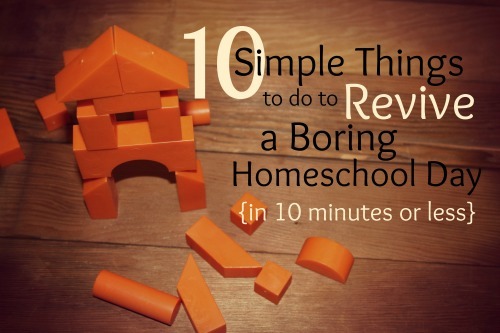 At first glance, boredom might seem like the kiss of death for the homeschool day. But, with a little purposeful strewing, you can launch your kids towards meaningful AND memorable learning...in 10 minutes or less. Want some more ideas for creating passion-directed learning? Be sure to join me on Instagram! 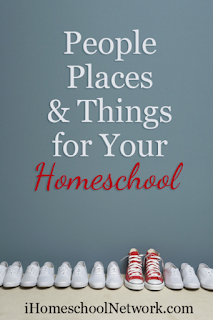 Check out more people, places, and things for your homeschool by visiting iHomeschool Network. Great post! Thanks for including the word collage. Hi Jamie, were you aware the the use of male pronouns to refer to a subject of unknown gender, or to a general subject is now considered to be archaic and sexist? You may wish to look into singular they. Thank you for the helpful article, and I hope you have a lovely day. Another example of PC run amok. And "they" is plural. Actually, Anonymous, language is a living and fluid system of socially agreed and culturally reinforced norms. While you are correct that "they" was plural for much of English's history, there is increasingly *correct* usage of "they" as nongendered singular. Some folks have been using the the pronoun "ze". Personally I prefer the singular "they" as it matches with oral language. (p.s. I have a PhD in English Composition / TESOL. I say this not to bully with authority, but to say that I'm not making this stuff up). Dear PhD and Drea, as you mentioned, you prefer to use the singular "they," and that is your right. I prefer to use the plural "they" and the male pronoun "he" when the gender is unknown because that is my right. I'm a female and don't find that reference to be sexist at all. My value and worth is not wrapped up in a pronoun. Hey, Jamie, I remember a while ago you mentioning a mother daughter conference you and your Sweetie Pea attended. We are looking for something like that 'round these parts. What was the name of it? Thanks and Happy Easter!! Jamie, I'm loving everything I read from you!! Thank you again for sharing!